The Jaxson revisits a long-lost retail landmark downtown and ponders what it will take for downtown to get back on retail's radar. The Northbank waterfront before the 1950s. 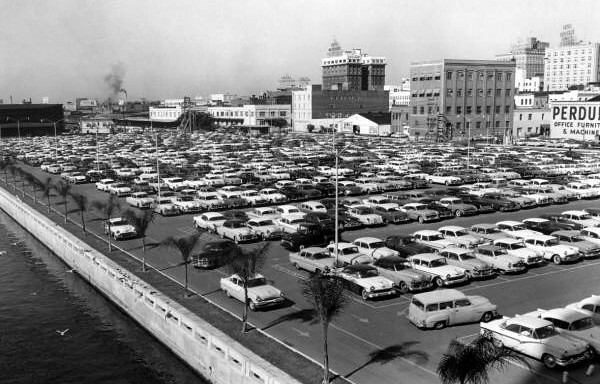 The appearance of Downtown Jacksonville abruptly changed during the 1950s. This decade would see the Northbank waterfront transform from a place dominated with wharfs, freight terminals, public markets, and wholesale businesses into a place characterized by automobile-oriented developments. 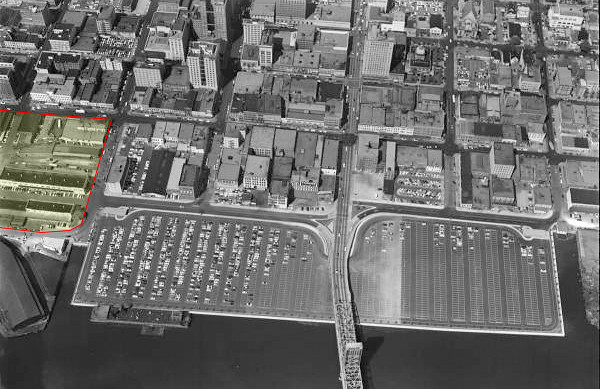 At the heart of this change was Sears Roebuck and Company’s decision to relocate from the 500 block of Forsyth Street to the downtown waterfront in 1956. Sears’ old location on the corner of Forsyth and Broad Streets was purchased by Cunningham Furniture when the retailer relocated. This building was demolished in the 1980s for the construction of a parking garage, which remains today. Much has been mentioned on The Jaxson about the destruction of the Northbank’s organic economic base during the mid 20th century that would lead to the death of downtown hotel and retail industry decades later. Ironically, one such unfortunate act was committed by a major retailer in 1956. That year, Sears made the decision to purchase 8.5 acres from the Seaboard Airline Railroad (SAL) for $1 million. To make room for the store and it’s 700-space surface parking lot, SAL’s railroad freight station and divisional offices were demolished and relocated to Warrington Avenue in Westside’s Lackawanna. In addition, several SAL tenants were forced to either close or relocate their activities from the site. These tenants included the Union Bus Terminal, Tyler Produce Company, New York Terminal Warehouse Company, and the Swift Company. Furthermore, to facilitate the development of the new store, Julia Street was abandoned and closed between the river and Bay Street. The SAL divisional offices, freight station, wharfs, adjacent tenant warehouses and businesses in 1953. The area highlighted in yellow would become the location of Sears. 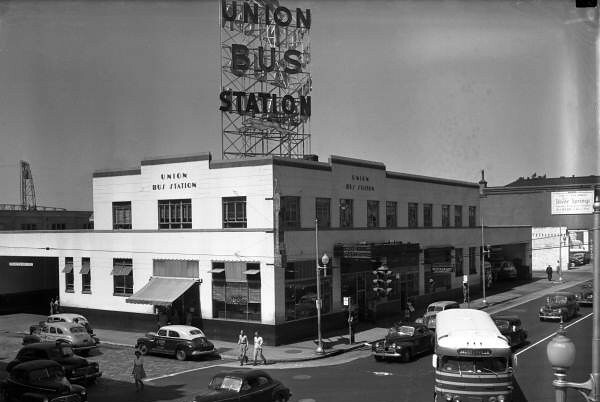 To make room for Sears, the Union Bus Terminal on the corner of Bay and Hogan Streets was demolished in 1957. 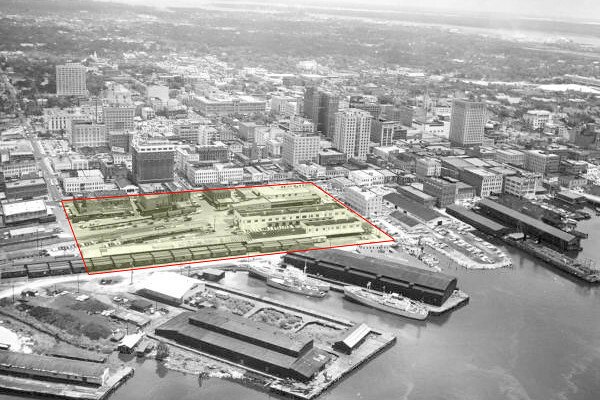 Now the site of the Jacksonville Landing, the wharves east of Hogan Street had already been demolished and filled in as surface parking when Sears made the decision to purchase the downtown railyard (highlighted in yellow). 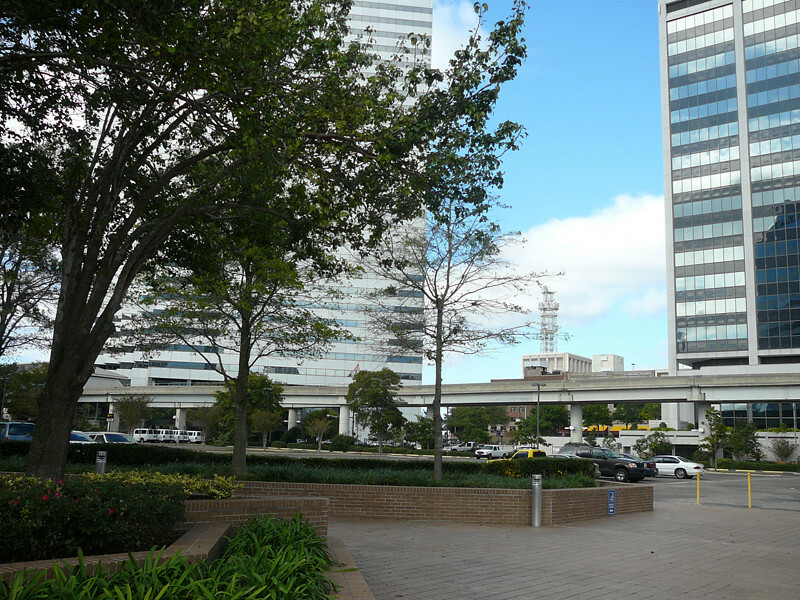 The site of the Jacksonville Landing in the mid 1950s. The SAL freight station and ancillary buildings can be seen in the background. 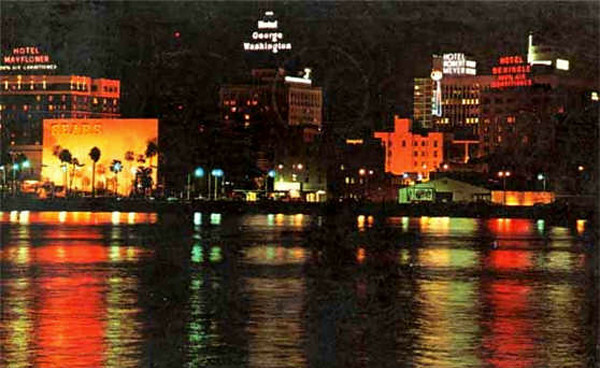 This tranquil scene shows the Northbank one night, circa 1960. Most of these buildings are now ghosts. Long gone are the Sears Department Store (closed in 1981 and torn down), the Hotel Mayflower (razed in 1978), Hotel George Washington (demolished in 1976), Hotel Robert Meyer (imploded in 1998), and the Hotel Seminole (flattened in 1974). 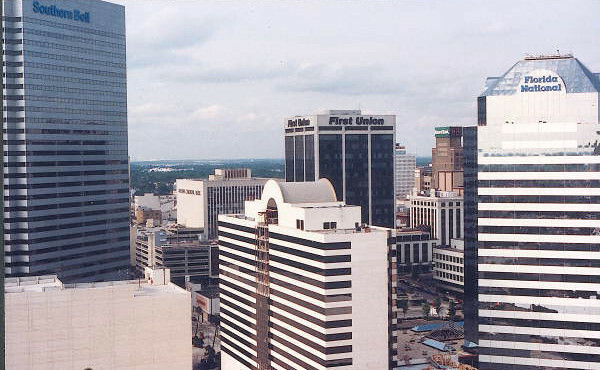 The Bank of America Building occupies the Seminole’s old site, the new Federal Courthouse stands at the spot of the Robert Meyer, and the Omni Hotel houses its guests where Sears once served its customers. 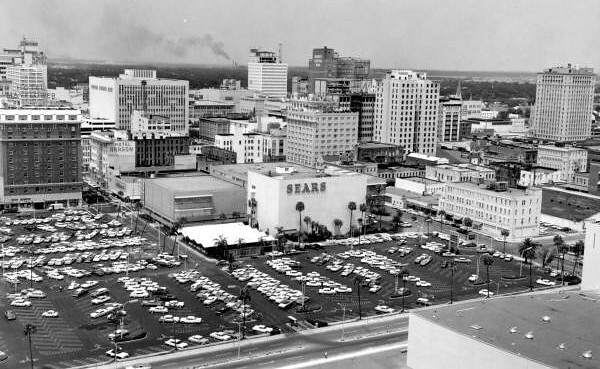 Downtown Jacksonville’s Sears store was envisioned to be the cream of Sears’ crop when it opened in 1959. At the time, Sears’ demographics indicated that Jacksonville was spreading mainly in three directions from downtown. In the event that a downtown store site was not located, the alternative option would have been to construct three smaller stores outside of Springfield, Riverside, and in the Southside. When completed, the new Downtown Sears store would be the chain’s largest in the South, measuring in at 260,000 square feet spread out over four levels and a basement. 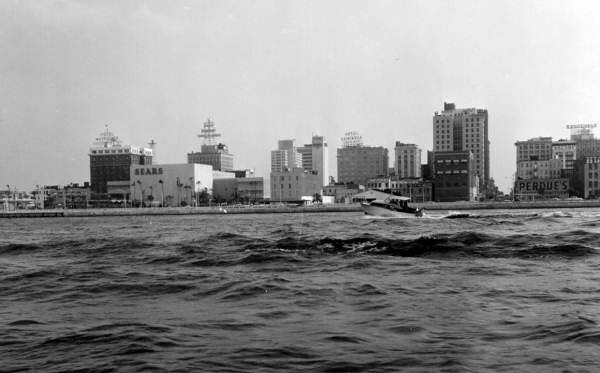 The Corky II cruising with the new Sears store and Northbank waterfront in the background in 1960. 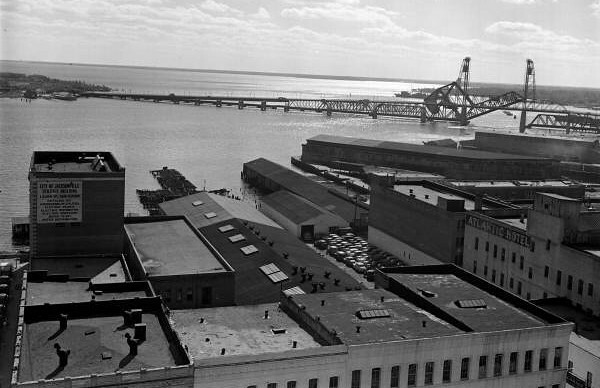 Sears in 1972 with Water Street in the foreground. Water Street was constructed over the alignment of rail lines that terminated at the SCL freight station. It surprises many Jax residents that Sears & Roebuck operated a downtown branch until the early 1980s. Yet notice the red Sears sign behind the auditorium in the photo above; the department store lay at the site of the present-day Omni Hotel. Over 40,000 townsfolk turned out for its opening day in June 1959. No doubt they packed the store’s 700-car parking lot. The branch ranked as the largest of the chain’s 734 outlets. Indeed, it contained 260,000 square feet of floor space. (The average Wal-Mart Supercenter requires 109,000 to 260,000 square feet or more.) The main Sears structure consisted of four stories and a basement, with transport provided by escalators and elevators. Soft, soothing music played in the background, and early advertisements boasted about the air conditioning that refreshed the whole building. To some degree, the place operated as a mini-mall in 1959. In addition to the usual departments, separate shops existed for pets, hobbies, gifts, tobacco, cameras, health products, and Boy and Girl Scout items. Other features included a watch and jewelry repair service, a beauty salon called the Lyric, and a home furnishings center with four decorating consultants who gave advice in the store or at one’s home. Two comfortable rooms also allowed customers to listen to records, radios, and record players in soundproof surroundings. And Sears heeded the needs of harried moms with tots under school age. While mothers shopped, little Baby Boomers could be left at a free nursery supervised by a registered nurse. Standing at the corner of Bay and Pearl Streets was a mammoth Sears automotive center, which serviced thirty vehicles at a time. Furthermore, customers could take advantage of a copious garden center. This was connected to the main structure by a covered walkway and a bridge over a reflecting pool. All in all, the entire Sears complex was staffed by over 1,100 employees. 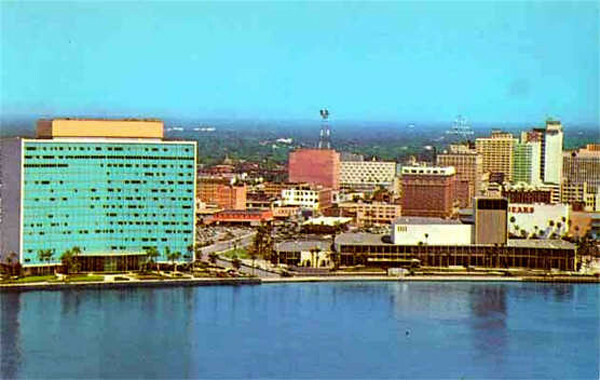 Dating from the 1960s, this St. Johns River photo shows the blue-green Atlantic Coast Line Railroad Building on the left and the black and white Jacksonville Civic Auditorium to the right. Dedicated in 1962, the auditorium represented the jewel of the city’s waterfront development. It even graced the cover of the local phone book that year. After extensive renovations during the 1990s nevertheless, the structure was reborn as the extraordinary Times Union Performing Arts Center. Behind the auditorium stood the Mayflower (Mason) Hotel, the brown building with the white-colored upper floor. The Mayflower structure was erected in 1912 and demolished in 1978. An aerial overlooking Sears in 1981. 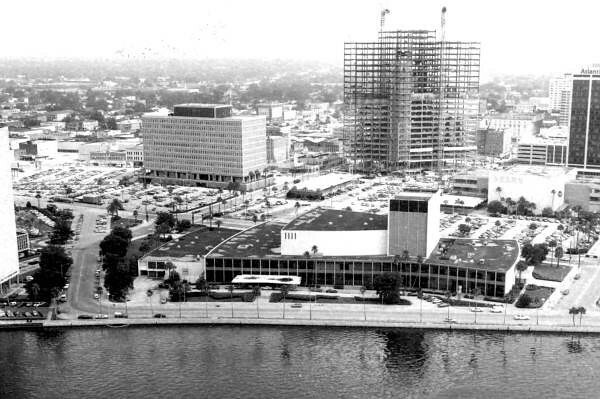 The Omni Hotel under construction in 1987. In 1972, the Cadillac was the leading location in volume of sales in the retail chain’s 13-state Southeast territory. However, the things that made Downtown Jacksonville’s Sears a trendsetter eventually became the location’s downfall. With four stories and a basement that required pumps operate 24/7 to keep water out, Jacksonville’s Cadillac was one of the company’s most expensive stores to operate on an annual basis. In addition, the systematic destruction of downtown’s economic base (relocation of maritime and railroad activities) in the 1950s and 60’s eventually lead to the closing of downtown’s major hotels in the early 1970s. This, coupled with a recession and a new Sears at the Orange Park Mall drawing suburban customers away, led company consideration in closing the downtown store in the late 1970s. That opportunity would come in 1981. With the chance to open in what was then the City’s premier shopping mall, Sears made the decision to close the downtown store and open a 218,000-square-foot store at Regency Square Mall. Upon the abandonment of the downtown store, the property was taken over by the Charter Company, who then moved forward with the redevelopment of the site into the Enterprise Center and Omni Hotel, both of which remain in this location today. The site of the actual Sears store is now a surface parking lot on the corner of Bay and Hogan Streets. Although the “Cadillac” of the South has been gone for 37 years, the problem that led to its demise continues to plague revitalization efforts today. At the root of these issues is the need to reestablish an organic economic engine, which stimulates activity that attracts businesses, residents, and retail. Since Jacksonville’s beginning, that activity has centered on taking advantage of downtown’s location where the railroad meets the river. Maybe it’s time to look into our past to fix what was broken? Photographs courtesy of the Florida State Archives.